Tip #1: To obtain the best bulbs at the best prices, be sure to visit an online bulb-dealer. I obtain most of my bulbs from Easy to Grow Bulbs.com. 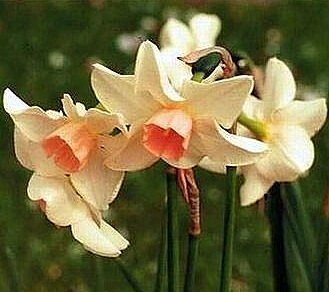 Narcissus ‘Erlicheer.’ Blessed with 7-15 fully-double, creamy white, powerfully perfumed blossoms atop each stem, this tazetta daffodil really takes the cake. I’ve grown it both indoors and out. Ht: 10-12 inches. N. ‘Pink Wonder.’ White petals, a ruffled pink cup, and a sunny yellow “eye” — there’s nothing about this daffodil that doesn’t send me over the moon! Ht: 16-18 inches. 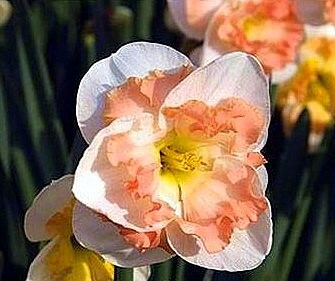 N. ‘Bell Song.’ We can thank Grant Misch, the world-class daffodil breeder, for this sweetly-scented, pastel-pink-cupped variety. Ht: 12-14 inches. 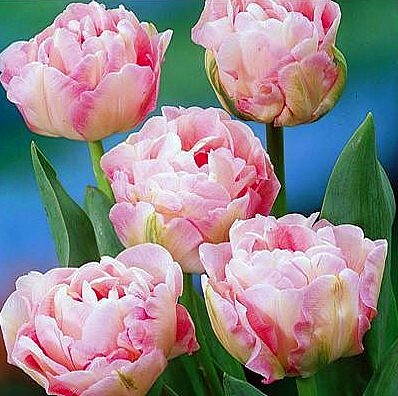 Tulipa ‘Angelique.’ The fully-double flowers are splashed with pink, white, and rose. I can’t wait to see this fragrant floozy in my garden! Ht: 16-20 inches. Tulipa ‘Fringed Mascotte.’ Another newbie for me. The raspberry petals with serrated edges are irresistible. 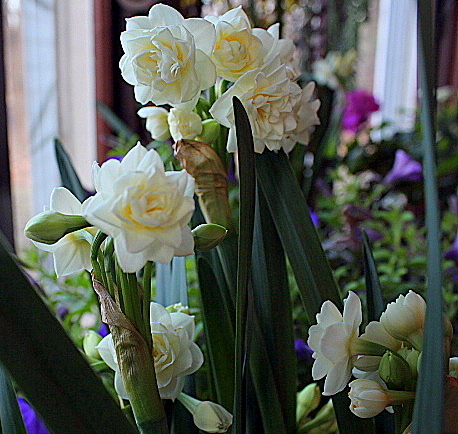 Probably I will hold back a few bulbs for indoor-forcing. Ht: 16-20 inches. T. ‘Foxtrot.’ Can I confess something to you? I’ll buy any tulip that’s named after a dance. This one offers fragrant, peony-like flowers in multiple shades of pink. Ht: 12-16 inches. 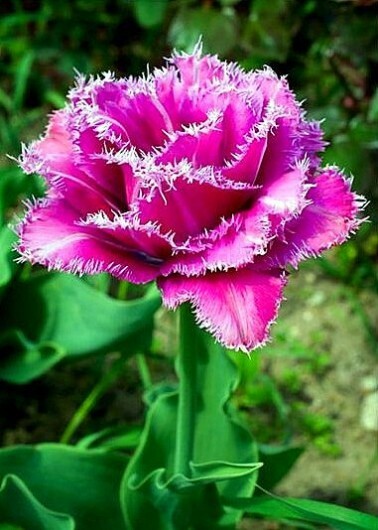 T. ‘Dreaming Maid.’ Who can resist this purple-splashed beauty? Not me! Ht: 20-22 inches. T. ‘Christmas Marvel, or, as I have seen it listed elsewhere, ‘Christmas Dream.’ Many years ago, I forced this pale-pink number in my bedroom window. And guess what? It bloomed in December! This time I’ll plant the bulbs on the other side of the glass. Ht: 12-18 inches. In the coming weeks, I’ll show you some other colorful creatures I’ve planned for 2016. 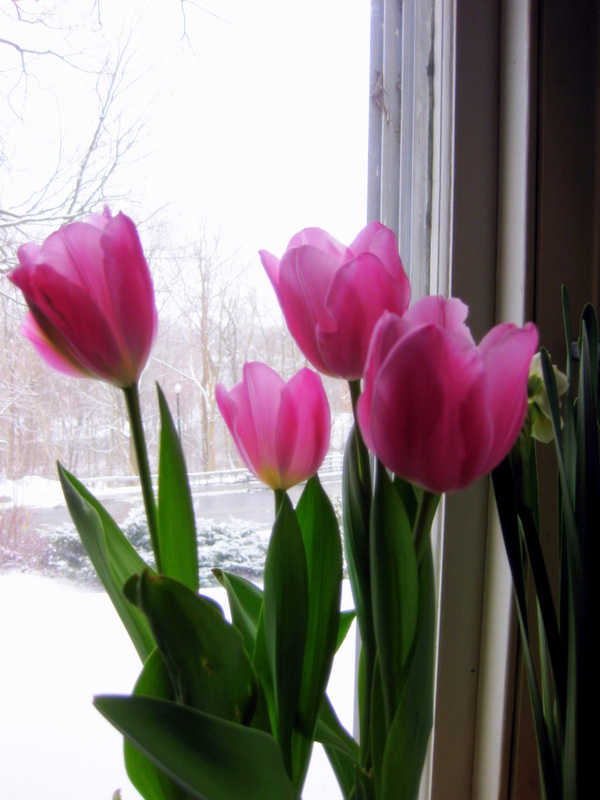 Meantime, let me know if you are looking forward to a fun season of bulb-planting! Just ordered crocuses, daffodils (jonquil types) camassia “Blue Melody”, with variegated foliage, Spanish bluebells, and my all-time favorite lily-flowered tulip, China Pink. That’s all very exciting, but today I had the excitement of my life. Last winter, while volunteering at the city greenhouse, I acquired a lot of boxwood cuttings, and tried your method for the first time. Today, I discovered 8 of the nearly 100 cuttings to have developed variegated foliage! Green leaves with a lovely golden yellow edge! They must be sports, because the 2 bushes from which the cuttings were taken had no variegation whatsoever. Those little rooted cuttings just energized me. Okay, there isn’t much that grows that fails to excite me, but these little bits are a marvel to me. Hi Mary in Iowa – Kudos to you on the boxwood cuttings! I have Spanish bluebells in the Woodland Garden, and they perform well every year. Just wish they’d spread faster! After many years of bulb planting, I am nearly out of space, so I did not order any this year. My fall will be a bulb-digging-up season, as in excavating all the tenders that need to come back inside for winter. This evening, the Calla Lilies are on the digging up list. Four colors, in about 6 locations and foliage fading. 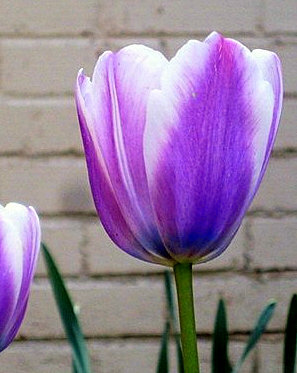 Your tulip color scheme is sublime! Kudos belong to the plants. All I did was plunk the cuttings into pots of soil (It was Februrary) and let them do their thing. The unexpected variegation thrilled me, although it probably happens for you all the time. I will probably let them grow into nice speciemen shrubs in the shade garden rather than as hedging. Except for the tulips, all of the bulb order is destined for the 7′ x 60′ parking strip garden I laboriously dug and planted this year. I left plenty of room between divisions and winter-sown seedlings for bulbs. Next year I’ll tackle the 100 foot parking strip across the front. Thanks for sharing all your good ideas. You’re the best! 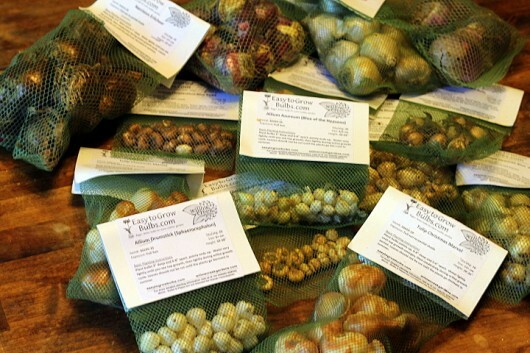 I have bought about 123 bulbs to plant this fall. Waiting for a cool day to plant. I bought crocus (which I’ve never grown) hyacinth, drumstick allium, several different daffodils (including pink, and Mt.Hood) and a few tulips as well. I can’t wait! It’s like planting presents for yourself to open later. Hi Brandy – Yes, presents to open later. Thank you for that! 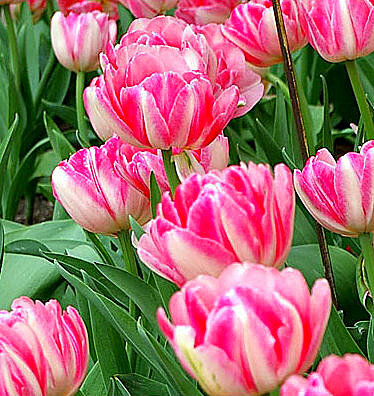 When it comes to tulips, where do you plant them? In beds where you discard the bulbs each year because the space is needed for other plants or in places where you let the foliage die down? 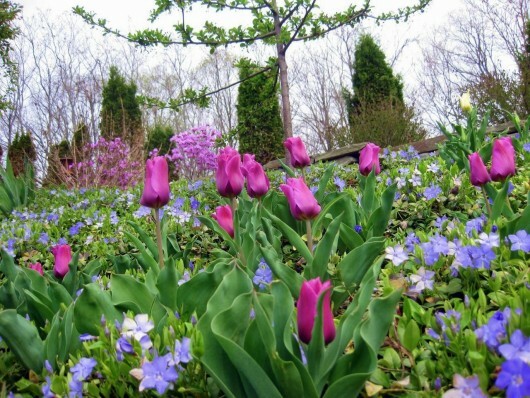 M tulips only bloom reliably for a couple pf years. Daffodils are more permanent plantings so end up where I don’t mind browning foliage. 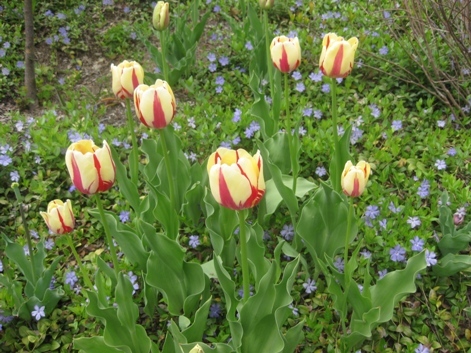 Hi Victoria – Whenever possible, I plant tulips in the same beds as ferns. The fern foliage hides the withering tulip leaves. Do deer ever eat your flowers? It seems the deer here (in Maryland) eat my buds right when they’re about to bloom! Frustrating! I’ve been window shopping bulbs for 2 weeks now … then decided I need to dig up my one daffodil and divide first before I purchase anything. It’s so dense that I will probably only need to buy tulips this year 🙂 Thanks for the new bulb source! Hi Kevin, I live in Mesa, Arizona and it is in the mid to upper 90’s pretty much into mid/late October or beyond some years. We don’t generally see “fall” til January, when the kids are able to jump in piles of leaves, although we do start to cool down at night in October . I’ve planted bulbs numerous times and mostly just end up with anemic looking leaves that couldn’t support a flower if their life depended on it. Can it be done here? Our soil is like concrete so the bulbs I planted were in a raised bed or in pots. I put them in around November/December. I’ve gotten to the point where I feel I’d be more successful taping the package picture to a stick & putting that in a pot than planting the actual bulb. Any ideas? turn into an “all you can eat” buffet for my local deer population. Off topic, when is your book coming out? Thanks for the tip about EasytoGrowBulbs.com; one quick peek at their website let me know I am overpaying. That said, I’m awaiting an order of 300 assorted daffodils for naturalizing that are going into four beds of perennials this fall. The deer devour everything in my NJ neighborhood, so no tulips for me, but I’ve had good luck this summer with draping my particularly deer-attractive plants with bird netting at night, then taking the drapes off in the morning. It’s the only thing I’ve tried that really works, and it gets me out for an evening and morning walk around the house. Not for extensive gardens like yours, but might help readers who, like me, have small garden beds. How can I keep the red tulips from turning yellow.? Look forward to your great ideas for everything on Sunday morning. First read of the day. Thank you!! I’ve forced Angelique a few times but tulips in the garden? Dream on! If the pocket gophers don’t get the bulbs over winter( underground where they are invisible) the deer munch the tops….and they don’t wait for nighttime either. They have just cleaned off my doorstep planters after ignoring them all summer, and developed a taste for flowering tobacco. Oh well ,we’ve had a frost already . I made the tomato pie. We loved it. Didn’t plant basil this year but hope to next year. I had to pay $2.50 for a few leaves. Now the biscuits could use basil too. Can you tell us where to order our bulbs? (Perhaps you have said and I missed it.) Thanks. Because I am just wired that way… I looked up climate zone and hardiness zone info for your area. Your climate zone is 5 which is called Low Altitude Desert and the Hardiness zone is 9a. Then searched for bulbs by zone, https://www.easytogrowbulbs.com/searchbyzone.aspx. The USDA Hardiness Zone map is helpful in determining what will thrive based on the coldest temps and the UA climate zone map helps in the other extreme of what will thrive in the highest temps and rainfall per year. I get most of my gardening info from Clemson University Extension Service but every state has a university that has an extension service that assists farmers and gardeners! There is also a Master Gardener program and part of the education requires volunteer hours assisting folks with problems.